Forty-nine changes of clothes were retrieved from Xin Zhui's tomb, most of them impeccably preserved, and represent perhaps the most spectacular of the tomb's many treasures. Among the fabrics are pearl-white ramie, loosely woven hemp, and brushed cotton -- not to mention an impressive array of silks. Verdant silk shoes, silk gloves embroidered with migrant birds, and a transparent gauze silk robe are only a few objects found in the Marquise's armoire. 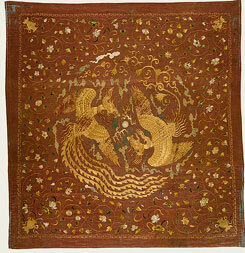 Even more impressive are the silk garments decorated with exquisite raised-thread brocade designs. Larger cross-shaped funerary banners display an entire theatrical scene, and offer insights into the complex social, political, and cosmological worlds of early Han Dynasty culture. Canopy with phoenixes, Yuan dynasty (1279–1368) Metropolitan Museum of Art, New York.